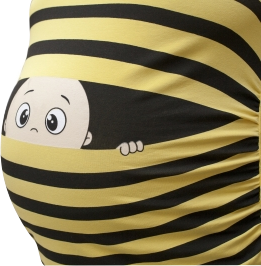 “Royal jelly and fertility” is a frequent topic in our blogosphere and for good reasons. Considered to be a superfood of fertility, royal jelly turns a bee larvae into a queen, which is, into a fertile bee. Working bees are not fed with this magic food after the age of 3 days old. And they will not be able to reproduce themselves. So, what’s with this substance? Can we apply it to humans? Royal jelly is a thick, milky substance, with a composition similar to pollen, made by the worker bees to feed the eggs and the queen bee. They do this by mixing honey, bee pollen and enzymes from their throat glands. This bee milk is used to feed the queen bee, for all its life. The drones (the males) and the worker bees are fed with royal jelly for their first 3 days of life, followed by a mixture of honey and pollen. The queen will eat royal jelly all its life and live up to 5 years laying up to 2000 eggs per day (approximately 1 egg per minute! ), while the worker bee will live up to 45 days of intense work, during summer, or several months during winter (when they don’t work). Royal Jelly is rich in amino acids, lipids, sugars, vitamins, and most importantly, proteins. It contains high levels of vitamins D and E, good amounts of B-vitamins, including high levels of vitamin B5 and vitamin B6, and amino acids, including all eight essential amino acids, and also has ample levels of iron and calcium. As all of these are essential to proper health and organ function, it is very easy to understand how Royal Jelly can help in assisting with fertility. Which are the benefits of royal jelly? 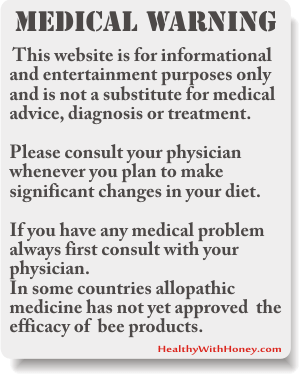 See “medical studies” below for the scientific results in treating different conditions with royal jelly. Is it good for fertility and sexual dysfunctions? It is ultra sour, with a bitter taste and a strong odor, but with a rare biological power, with strong effects on the bee’s endocrine, hormonal, and metabolic systems. In humans, it was showed to increase libido, support egg and sperm health, diminish and reduce the signs of aging and thus improve sexual activity and fertility. Royal jelly increases the level of luteinizing hormone in the blood (which, promotes ovulation) and are essential for amenorrhoea, oligomenorrhoea, irregular menstrual cycles, or the treatment of women egg failure. Fresh royal jelly has the capacity to mimic the functions of estrogen in humans (as showed in the Japanese study made in 2007), which leads to regulating hormones and balancing them. This may explain its good results in women suffering from polycystic ovary syndrome (PCOS), and menstrual irregularities. – A decrease in total cholesterol is noted in the range of 10% associated with 50-100mg of Royal Jelly daily. In Russia, Ludyanski treated hospitalized patients with Royal jelly, for different conditions. The results indicated much success in treating women with climacterium and sexual dysfunction. In men, the rate of very good and good improvement versus no improvement, in men with sexual dysfunction, was 26 to 5. In 1974, Zweer, also reported successful treatment of climacterium problems in 100 women, aged 40 to 62. After an intake of 20 mg of royal jelly for 2 to 4 weeks, the symptoms disappeared in the majority of the patients: hot flashes, sleeplesness and irritability disappeared and work capacity improved. 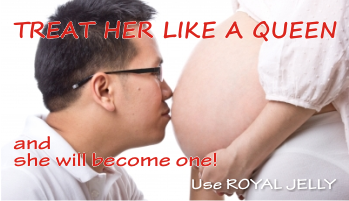 In the book “The infertility cure: The ancient Chinese Wellness program for getting pregnant and having healthy babies”, published in 2004, by R Lewis, it is claimed that royal jelly improved fertility in both men and women, in men by increasing the quality of their sperm, and in women by increasing the quality of their eggs. Royal Jelly itself does contain a testosterone. One study was made in infertile men, using Royal Jelly at 25, 50, and 100mg daily for 3 months. Royal jelly increased testosterone by 22.01%, 19.8%, and 20.4%; whereas the control group experienced a non-significant increase of 8.33%. The optimal dosage needs to be further researched. In 2007, a study done in Japan showed that royal jelly has the propensity to mimic human estrogen. This may help people with low estrogen levels. Estrogen is essential for healthy bone formation and healthy gene expression, and is vital for a healthy menstrual cycle. This study also showed potential for increased size of uterine cells in the rats studied. – Kridli, RT and Husein, M Q, publishes in 2002 the study: “Reproductive responses following royal jelly treatment administrated orally or intramuscularly into progesterone-treated Awassi ewes.” in Animal Reproductive Science. – Elnagar, S, publishes in 2010 the study “Royal jelly counteracts bucks’ “summer infertility”. – Hassan, A publishes in 2009 the study “The effect of royal jelly on sexual efficiency in adult male rats.” Iraq J.Vet.Sci. – Kohguchi M, Inoue S, Ushio S &Co, publishes in 2004 “The effect of royal jelly diet on the testicular function of hamsters”, in Food Science and Technology Research. And many others. So many studies, with such good results, show that royal jelly has estrogenic and proven effects in increasing animal fertility, that can only lead us to the conclusion that royal jelly can also positively influence human fertility. From research, good results were observed for an intake of 50 to 500 mg doses per day, but they still have to determine the optimal dosage for specific conditions and on a long term. A 6g daily dose has also been shown to provide benefits. For therapy use, the recommended doses are: children 20-100 mg/day, adults 200-500 mg/day. for women: a dose of 1/2 teaspoon per day. Best results are expected in 3 to 3 month of daily intake. The treatment can be continued for 12 months, but if you still haven’t managed to get pregnant, than royal jelly is not your answer. for men: a dose of 1/4 teaspoon per day. best results are expected after 1 to 3 months. The dosage differs a lot according to the product, and the other substances added in it. For storage details, please visit Royal Jelly. You may be allergic to royal jelly. If you have a high incidence of allergy, bee venom/pollen allergy or asthma, then avoid taking royal jelly. 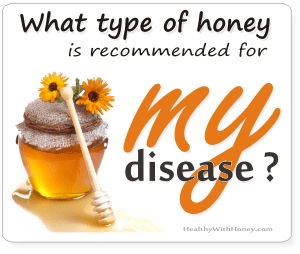 And talk to your medical doctor if you have decided to take royal jelly. Royal Jelly has been used for centuries to aid in the treatment of infertility and today it is also highly recommended on many fertility websites. With good reasons and excellent feedback. It is recommended to buy royal jelly from your locals and immediately store it in the freezer. If you can’t do this, consider buying it in a honey combination, or as pills containing lyophylised royal jelly (the product has been freeze dried until all water was removed), because it is more stable. • Zweer, V. Influence of apilac in climacterium syndrom. Inform. Bulletin o matochnoe molochko, Rjazan, 1974. Mad honey – Are you high? What is the best bodybuilding supplement? This is very interesting. 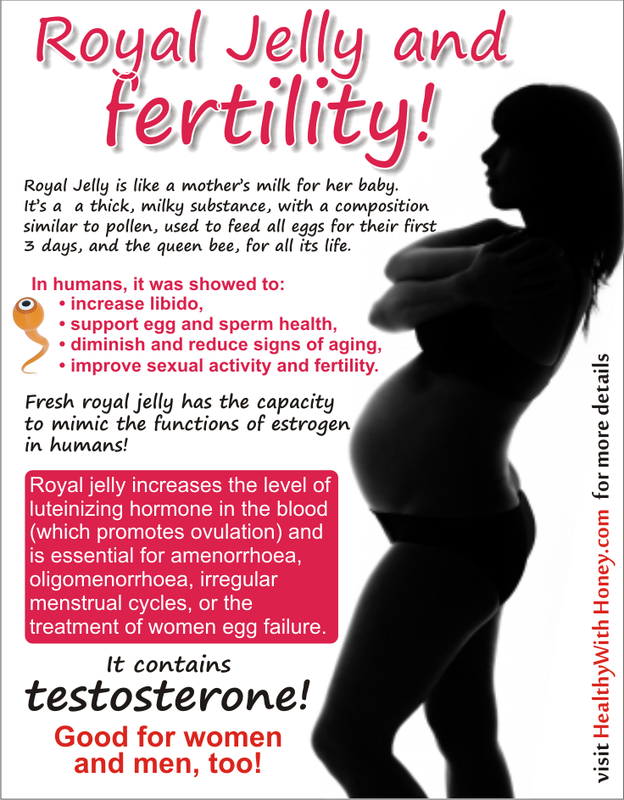 Never knew royal jelly may have beneficial effects on fertility. This can be a consideration as my wife and I want to have kids soon. 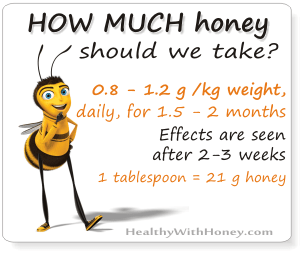 Honey with royal jelly is very good for prophylactic purposes, because the concentration of royal jelly is low, usually 2%. For a therapeutic one, royal jelly should be fresh. 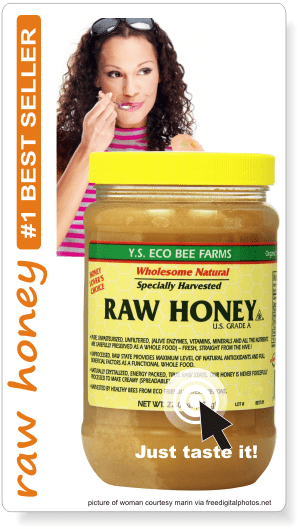 On this page, What is royal jelly good for and how to take it. you can see what’s the dose according to disease. When dealing with infertility, studies have shown that treatments should last for 28 days, taking 1-2 g of royal jelly daily. It follows a break of another 28 days and then one should resume the treatment, till 6 courses of treatment. It has been shown that the safe doses are between 1 to 5 g per day. Always start with very little and increase the taken amount daily till you reach the desired dose. Fresh RJ should be taken on an empty stomach, with at least a quarter of an hour before eating. Please make sure you have read the contraindications page. So, I think it is ok to drink your tea with honey and RJ, but also add the fresh one for a treatment. 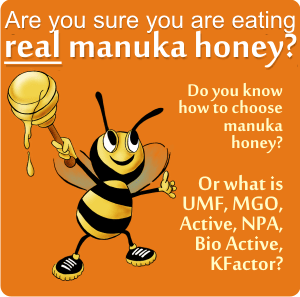 Is there a difference between royal jelly and queen foods? No, I don’t think there’s a difference. Royal jelly is the food of the queen, so probably in your country this is another way of naming royal jelly. I know royal jelly is good for fertility,is it in pitcular good to help with sperm mobility etc..?? Royal jelly is good for men, too. Studies say the quality of sperm is improved, perhaps this includes mobility as well. The correct dose is also very important. So yes, your husband should take RJ, too. Very interesting post. Now I now why it’s called royal jelly, that’s what the queen eats. I use to think it was marketing name to appeal consumers 🙂 It’s good to know that there are natural ways to help people struggling with infertility. That being said, I would probably use the pill version as it seems to be less complicated to keep its properties. Royal Jelly – yes, they couldn’t come up with a more relevant name. It’s a jelly and is for the queen. Anyway it’s better than “the queen’s food”!, right? Tablets are as good and safer, of course. I am not married and not planning on having kids anytime soon and I have never heard of royal jelly so thanks for the information here! Very interesting stuff lol. Sometimes in life things just happen, you don’t need to make plans for them. 🙂 Americans don’t know about all the products of the hive, only about honey. I know, and that’s really a pity. But now you know, spread the news! I think this is one of much significance to me. And i’m satisfied reading your article. The website taste is wonderful, the articles is really excellent.